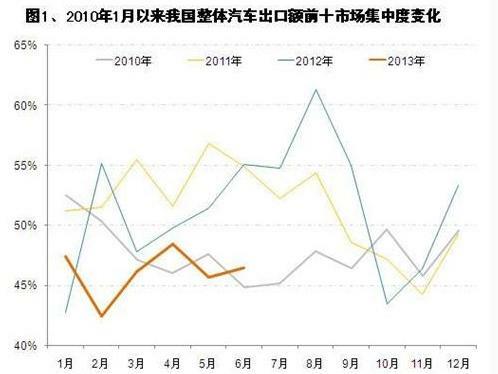 The performance of China's auto enterprises in the domestic market and overseas markets has recently been reversed. When the domestic auto market fell into a downturn in 2012, overseas exports of automobiles (referring to vehicles, the same below) increased significantly, and exports increased by 30% to exceed one million units for the first time. In the first half of this year, the domestic auto market grew rapidly, and the export growth rate was lower and even declined. Export sales decreased slightly by 0.6% to 487,000 vehicles, less than 500,000 vehicles. Not only does the auto export volume performance is contrary to the domestic auto market, but also the concentration of auto exports in China. According to the data compiled by Gasgoo.com, in the past few years, the national market concentration of China's top ten auto exports (hereinafter referred to as "automotive export market concentration") has fluctuate around 50%. However, when the domestic auto market growth rate is relatively slow, the auto export market concentration is relatively high; while the domestic auto market growth is fast, the auto export market concentration is relatively low. In the high growth of the auto market in 2010, the auto export market concentration was generally below 50%, while in the 2011 and 2012 when the domestic auto market growth slowed down, the auto export market concentration in most months was above 50%. In the first half of this year, the growth rate of the domestic market returned to the fast-growing track, and the concentration rate of auto export markets declined again, both being less than 50%. Since 2010, China's auto export market has been mainly concentrated in Iran, Algeria, Russia, Brazil and other countries, but the ranking pattern is not stable. In the past three years, the top three markets for Chinaâ€™s auto exports in 2010 were Algeria, Iran, and Vietnam. In 2011, they were the Russian Federation, Brazil, and Iran. In 2012, they were Russia, Algeria, and Iran. Worth mentioning is the Brazilian market, which has a large fluctuation in China's auto export market. In 2011, it had entered the top ten of China's export market for 11 months, and the accumulated amount was the second largest market for Chinaâ€™s auto exports, but due to its significant increase in automobile import tariffs in recent years. Chinese auto companies have increasingly considered or are about to achieve local production in Brazil. Therefore, in recent years, Brazil has rarely appeared in the ranking of China's top ten auto export markets. In 2012, it only entered twice, and only entered the first six months of the year. In the first half of this year, Algeria earned 476 million U.S. dollars for Chinaâ€™s auto exports, which has become Chinaâ€™s largest auto export market. Followed by Chile and the Russian Federation, Chinaâ€™s auto exports amounted to 397 million U.S. dollars and 362 million U.S. dollars respectively. CG fuel tank, side cover, frame body, front and rear wheel, front and rear tire, front and rear shock, spoke wheel, rim, seat, carrier, mirror, speedometer, handle switch, head light, rear lights, turning lights, handle bar, main stander, side stander, rear fork, hub cover, hub, air filter, battery, axle, cables, wire harness, regulator, flash, start relay, CDI, horn, fuel lock, chain, muffler, steering stem, chain cover, brake pedal, front and rear fender, springs, front safe guard, back seat, helmet.